Mortgage rates are rising and the housing market is getting weaker. In May of 2013, the 30-year fixed rate mortgage was 3.59%. Today it is 4.71%, more than a full percentage point higher. That means that the payment on a $200,000 loan is 15 percent more than it would have been just two months ago. The higher rates mean that would-be homebuyers are getting less bang for their buck and might not be able to afford their dream home. 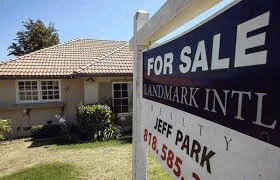 It means that housing sales will fall and prices will drop. Higher rates are poison for housing. Last week, the Mortgage Bankers' Association (MBA) announced that mortgage purchase applications had dropped 3 percent from the week before following a downward trajectory that has persisted for the last two months. At the same time, new home sales plummeted 13.4 percent in July to 394,000, less than a third of their total in July 2005 when sales tipped 1,200,000 per year. The impact on existing home sales is still unknown because the data from June will not be released until late September, but given the uptick in rates, we can assume that sales will be well-below expectations. The housing market is cooling, sales are sluggish, and prices are flattening out. The recovery is over. "The softening of investor demand has also coincided with a drop in sales of so-called distressed properties, whether foreclosures or short sales. These homes usually sell for less than others and had been the focus of investor interest. "All it will take is the wave of 'cash-money' buyers 'easing off' a bit; 'some' of the organic first-time and repeat buyer cohort stepping away due to the sudden lack of 'affordability'; and/or a wave of supply from 'panic sellers' hitting the market to send sales volume and prices down sharply, over a very short period of time." "Some think the rate 'surge' will have little impact... while the bears... think the rate surge was a rare and powerful 'catalyst' only rivaled two times in the last seven years. The first, when the housing market lost all it's high-leverage loan programs all at once in 2007/2008; and the second, on the sunset of the Homebuyer Tax Credit in 2010. The media has tried to downplay the importance of the spike in rates, pointing to the fact that rates are still very low by historical standards. But Hanson disagrees. He thinks that the "the greatest stimulus of all time" has just been removed, leaving the market exposed to a catastrophe similar to the downturn in 2008 or 2010. If he's right, then September existing homes sales (which will be reported in late October) should fall precipitously, which they should since the fundamentals --wage growth and employment-- are still weak. Eventually the abysmal condition of the underlying economy will resurface. Bernanke's smoke and mirrors can't last forever. Keep an eye out for September's existing homes sales.